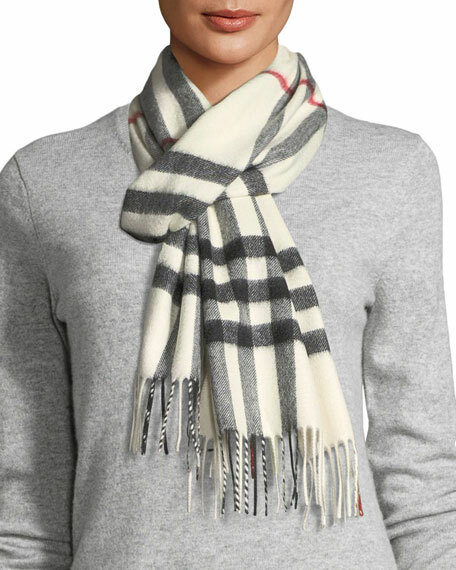 Warm, brushed cashmere Burberry scarf showcases the house's iconic check. Approx. 66"L x 12"W (168 x 30cm). Fringed finish on both ends. 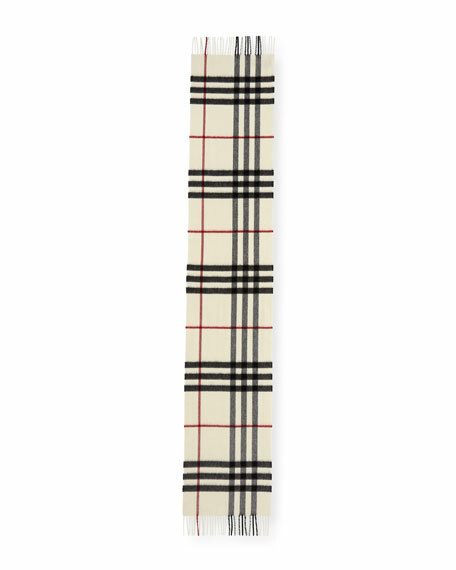 Burberry washed heritage stripe scarf. The fabric is washed in local spring water and then pressed and lightly steamed for a soft, lustrous finish. Approx. 78" x 23.6" (198 x 60cm). May be styled multiple ways. Eyelash fringing at the edges. Wool/cashmere. Specialist dry clean. Made in United Kingdom. Burberry woven square annotated with runway Horseferry print. Approx. 35.4" (90cm) square. Lightweight, seasonless fabric. May be styled multiple ways. Burberry woven square annotated with runway Horseferry print. Approx. 35.4" (90cm) square. Lightweight, seasonless fabric. May be styled multiple ways. Contrast, hand-rolled edges. Mulberry silk; dry clean. Made in Italy.